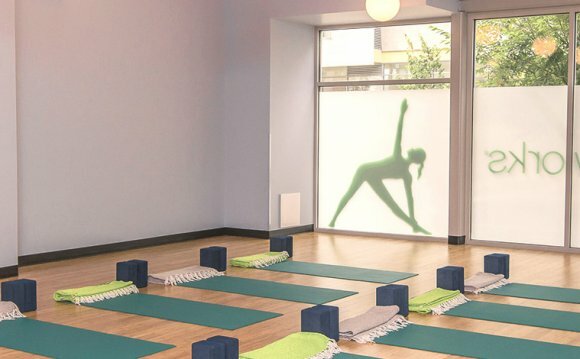 Yoga Studio offering classes 7 days a week with 10 different instructors. New Aerial Yoga Swing Classes, Hot Yoga at 95 degrees, herapy/seniors, Prenatal, Beginner, Vinyasa, Ashtanga. Workshops to enhance your practice and wellness. Ayurveda, health and wellness from India with Practitioner to help you holistically. Boutique accessories, and local art, eclectic gifts, clothing and ayurvedic herbs and oils. Starting years ago teaching at the sporting goods store I worked at full time. The students told me I needed a better space for classes, so I rented a room in the Masonic Square. I Started with one other teacher in hopes the classes would be better environment. The classes grew rapidly and 9 months later a different spot opened in the small downtown mall and I took the space over. I went to Ayurveda School to add a more well rounded vedic healing space. I continued to add more to the boutique, added Ayurveda Massage Treatment and now expanding with two practice rooms. Thanks to my wonderful teachers all RYT 200 or more and to the public that steps into the space, tries yoga and finds the health and wellness benefits. A Graduate fro Norhtern Mi. U. in Exercise Science and ERYT500 yoga teacher. teaching yoga steady for 16 years. A Ayurveda Diet and Lifestyle Practitioner. I love the work of helping others. Yoga helped me tremendously as an athlete and wanted to share with others.